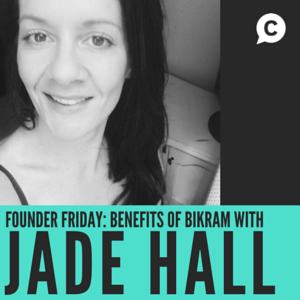 Meet Jade Hall, director and owner of Bikram Yoga Ascot Vale. I’ve been practicing at BYAV the last few weeks, and have been so impressed I HAD to feature her on Founder Friday! To the non-yogi, you could describe Bikram as ‘yoga in a sauna’. They heat the room to 39 degrees and you work through a series of 26 poses over 90 minutes. You breathe. You rest. And you sweat. Oh boy, do you sweat. You’ve never really sweated until you’ve experienced the intense heat of Bikram. And it was this that got Jade hooked. 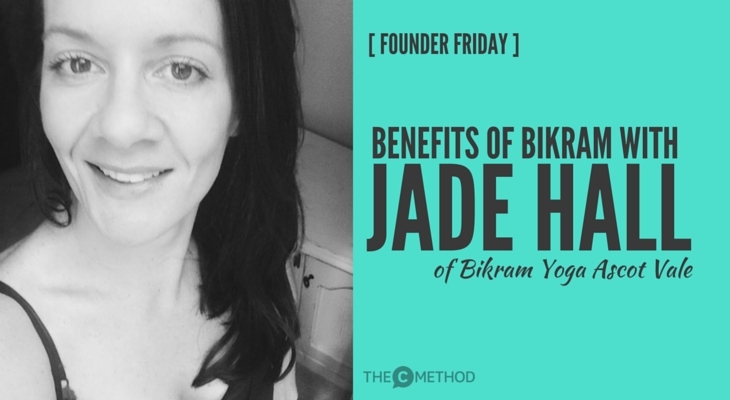 After trying different yoga styles for a number of years, Jade discovered Bikram. She explains that for her personally, the heat acts as a mental distraction, which keeps you (mentally) in the room. It also helps you to work harder, challenging you both physically and mentally. …it’s hard to think about anything else. I imagined Jade had always been a cool, calm, centred yogi, but I discovered this was not the case. She was previously an IT project manager, where she dealt with big businesses, working long, stressful hours. She loved the job, but eventually realised the ongoing stress was taking a toll on her health. Plus, the demanding hours didn’t suit the lifestyle she wanted for herself. So she left her job, and took some time to reassess. She realised that it was yoga that had been helping her through the stresses of work, and that it was something she wanted to help others with too. So she began hunting for a yoga studio to purchase. Her time came last year when she was offered to buy BYAV, and she jumped at the chance. BYAV now has classes 7 days a week, and offers Bikram and Yin yoga styles. The community has been building solidly, with their first big charity event next Saturday 13 June to raise money for mental health. I truly believe the yoga room, a committed practice and the wonderful warming community associated is your best friend in times of need. Whether that be depression, having a bad day… the list goes on. Half the battle is simply showing up, but trust me… IT IS WORTH IT. And with the mental shifts came physical changes. Yoga has helped her lose an incredible 40 kilograms – and keep it off. She explained that she would lose the weight, but then it would creep back on. I ask what she loves most about what she does. Another thing Jade does extremely well to connect with students is remember EVERYONE’S name. It’s amazing. Jade believes that using people’s names is critical for making a good connection with the students, and as a student, I agree. It’s little things like this that make you feel like you’re a part of something. You feel like the instructors really care about you. In class, just breathe. Breathing WILL get you through. Try your hardest, whatever that may be. Every day is different. If you sit down on your mat, it doesn’t mean you’ve failed. It means you’re looking after yourself. Or you need a moment. And that’s ok. So if you’re looking for something to warm you up this winter, I encourage you to give Bikram a try! Come along to the Bikram Yoga Ascot Vale charity event on Saturday 13 June. Classes will be running all day, they are pay-by-donation, plus there will be live music and yoga-by-candlelight. Click here to join the Facebook event and register!